Community users, visitors and guests can print and copy at UBC Library with the UBC Guest Card. 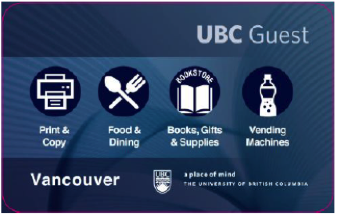 Please note that the UBC Guest Card in Vancouver is different from the guest access id which is required for login to library workstations. 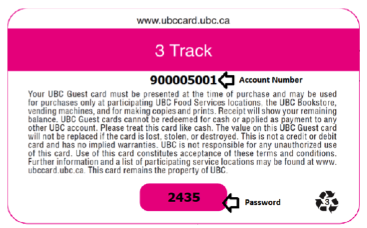 At the UBC Okanagan Library, the UBC Guest Card is also used to login to library workstations. UBC Guest Cards can be purchased at any UBC Library circulation desk at a cost of $5 (cards are preloaded with $5). Cards can also be purchased from the card vendor on level 3 of the Irving K. Barber Learning Centre. Funds can be added to your UBC Guest card via the card vendor on level 3 of the Learning Centre, online via http://payforprint.ubc.ca, and at both UBC Okanagan cafeterias. To login to the online site, use the account number and scratch-off password on the back of the card. Once you've logged in, select “Add Money – Visitors”. To manage your account, go to: http://payforprint.ubc.ca. If you wish, you may register your email address and change your password. This will enable you to use your email address and a password of your choice to access UBC's Pay for Print service. Visit the "Printing with Pay for Print" tab above for step by step printing instructions. There are two methods for printing at UBC Library: Web Printing and Library Workstation Printing. The Web Printing option allows you to print to a Pay for Print printer from your laptop or personal computer. Log in to www.payforprint.ubc.ca. Login with your EAD account number and password when the pop-up login is displayed. For students, this is your CWL username, suffixed with “.stu” (e.g., yourcwlusername.stu). Use this username with your CWL password. For faculty and staff, just use your regular CWL login credentials. For visitors this will be your UBC Guest Card account number and password. Verify that you have funds available in your account. If not, click on “Add Money – UBCcard” or "Add Money - Visitors". Select the printer that you want to use. To print to a Library printer, choose either library\colour or library\mono (black & white). If you do not see the printer that you want to use, you can use the search feature to find the appropriate printer or queue. If you are unsure of what printer to use, ask at a library service desk. Click on “Upload from Computer” and select your file. A list of supported file types is shown on this page. Click on “Upload & Complete” after you are done selecting your files. You will be redirected to a print status monitoring page. The print job will be held in the system (for 3 hours) until you release it at a Library print station. 10. At the print station, swipe your UBC Guest Card in the card reader OR login with your card number and PIN. The workstation printing option allows you to print from a UBC Library workstation. From a Library workstation, click “Print” in your application. Configure your printing options (double sided, colour queue, etc.) and submit your print job. 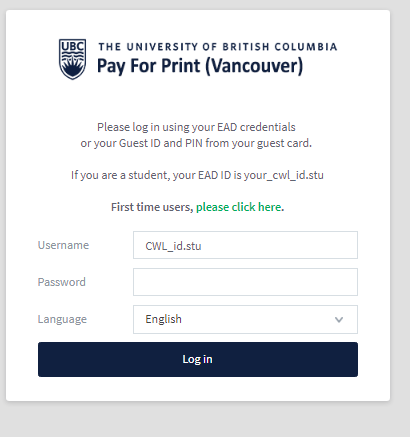 When the Pay for Print pop-up login is displayed, login with your UBC Guest Card account number and PIN (Username and Password). If the pop-up window does not display, click the green "PaperCut MF" icon on the right hand side of the bottom task bar. Proceed to a Library print station and swipe your UBC Guest Card in the card reader OR login with your card number and PIN. Please note that print jobs are deleted after 3 hours. 1)The quality of my printout is very poor — who can I get a refund from? Please visit a UBC Library service desk at the nearest library branch. 2) Why can’t I log in to a workstation? You need a Guest ID to log in to a library workstation. This is separate from your UBC Guest Card. Please visit a UBC Library service desk at the nearest library branch. 3) I want to add value to my card in cash. Where can I do this? You can add value to your card with cash by using the card vendor located on level 3 of the Irving K. Barber Learning Centre. 4) Help! I've forgotten the password to my UBC Guest Card. How can I recover it? To recover your forgotten password, please click the Forgot your password? link from the UBC Guest Card Program page.